This condo has one of the best locations in Old Town, at the bottom of Main Street just steps away from the Town Lift, and the best restaurants, shops and apres-ski activities that Park City has to offer. Our unit is on the top floor and in the same building as the indoor jacuzzi, sauna and locker rooms, so there is no need to go outside. We are on the free shuttle bus route and just minutes away from Deer Valley so it is not necessary to rent a car. The town lift takes skiers up to the Bonanza lift at Park City Mountain and bypasses the busy Payday lift at the Park City Mountain base. You can ski back via the town trails at day's end or mid day for lunch in town or at the condo. Enjoy the indoor/outdoor jacuzzis and the heated swimming pool. Excellent location for the Sundance Film Festival. 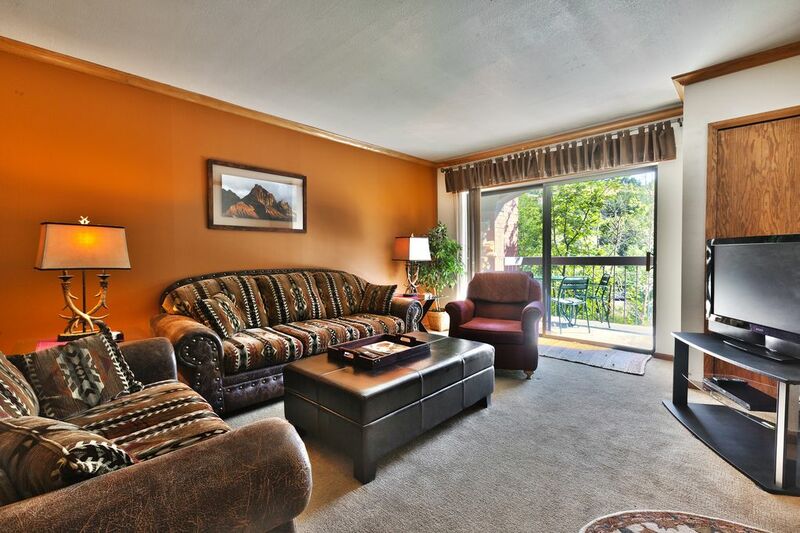 The condo has been updated with all new carpet throughout. The living room has all new lighting, new end tables, a storage ottoman and a brand new queen size sleep sofa and loveseat. There is a copper slate wood burning fireplace, and a 37 inch flat screen HD TV with a wireless Blu Ray/DVD player. The kitchen has all new stainless steel appliances including a Bosch dishwasher, Frigidaire Gallery microwave oven mounted over an electric range with induction cooktop and a GE energy saver refrigerator. Oak hardwood floor and a new granite counter top and pass through to the dining area. The kitchen is well equipped with an abundance of small appliances, cookware, serving dishes and flatware. Sliding door out to private balcony. The unit has two twin beds that can be put together and made up as a king bed as requested on your rental agreement and another Flat Screen LCD TV with Blu Ray player. Brand new dresser. High quality Ralph Lauren Duvets and all cotton sheets are provided for guest comfort. The new divided bath features a separate vanity area with granite countertops and undermounted sink. The bathroom in the unit was completely renovated with new tub and toilet in 2013. New tile surrounding the tub and on the floor. Secure Hotsite Wireless internet provided along with cable TV/HBO. There is an outdoor hot tub between the two Park Station buildings. An outdoor heated swimming pool is available for ski season and summer use. Guest are given information on ground transportation and discount lift tickets upon booking. Guest can store their skis at the ski valet next to the town lift overnight as long as they own their own skiis or rent them from that location. Excellent location with a stop outside Park Station on the free shuttle bus system makes it easy to get to the supermarket, Kimball Junction and Redstone for outlet shopping, additional theaters, dining, food stores and other activities that can be enjoyed by non skiers or those wishing to take a day off from the slopes. We are life long skiers and real estate professionals. I am a real estate broker with a property management company and my husband is a commercial architect and developer. Because of our backgrounds, we are uniquely qualified to self manage our condo. We take care of everything and do a lot of preventative maintenance so that you can have a worry free vacation. After 26 years of western ski trips, we decided to buy in Park City because of the variety of terrain and the proximity to the Salt Lake City Airport. We enjoy leaving on a morning flight and skiing in the afternoon, which we have been unable to do at other western ski resorts. We looked all over Park City and Deer Valley and both felt that Park Station had the best location. It is at the bottom of Main Street, yet the condo complex is quiet. The town chairlift is just steps away and the free buses stop right at Park Station, so a car is not necessary. There are indoor and outdoor hot tubs and a swimming pool that is open for the ski season and from mid June to Labor Day. The condo is our second home, not just a rental property. Therefore we are constantly upgrading and making improvements. We have come to enjoy Park City year round and share that knowledge with our renters to insure that they have a good time and make the most of their vacation. We provide all the insider info to our guests including where to buy discount ski tickets so they can save money. Divided bath makes it easy for a group of four to get ready for skiing. Inner area with shower over tub and toilet is separated from the sink and vanity by a door that locks. Tiled tub surround with deoorative inset tiles and glass sliding doors. For incoming and local calls only there is a land line. Newer furniture throughout with comfortable queen sized sleep sofa. New stainless steel Bosch dishwasher. Extremely quiet while operating. Stainless steel Frigidaire Gallery electric range with induction cooktop. Oven features standard baking or convection options. New stainless steel Frigidaire Gallery microwave oven mounted above the range. Spice rack, salt, pepper, packets of sugar, coffee filters included. All New Stainless steel appliances include Bosch Dishwasher, Frigidaire Gallery Microwave over electric range with induction cooktop,, Blender, Toaster, Coffee maker, Spice Rack, granite counters. TV with HBO provided. 50+ stations currently available from Park Station bulk TV source. New HD LCD flat screen TV with HBO included and wireless Blu Ray/DVD player. Flat screen LED TV in bedroom with blu ray player. Bedroom has two twin beds which can be put together and made up as a king size bed if desired. Be aware that is condo faces a noisy road. We left early. Beds and pillows were hard and bathroom tiny. Oh well. 60 Five star reviews on VRBO for this two bedroom lockout condo with 27 for the one bedroom option, 26 for the two bedroom option and 7 for the hotel room option. All face the same direction in the Main street Old Town area. This is a very active and popular area with traffic on all sides of our two building condo complex. We have never had a complaint about road noise as by 10PM the traffic to the ski areas, restaurants etc. ends. The new windows that are double insulated plus the blinds and the curtains keep out road noise effectively. Different guests have different requirements for mattresses and pillows and it is impossible to satisfy those who want a soft mattress and those who want a firm mattress. We have extra pillows available of different types that are available upon request. The mattress has a pillow top pad on top and we have never had any negative complaints about the mattresses before. The photos of the bathroom show the size accurately. The space is divided for convenience with a 5' X 5' area for the toilet and tub and a door separating the 5' X 5' vanity/sink area. This allows the guests flexibility so that two people can use the bathroom at the same time. . All Park Station bathrooms are set up the same way. The amenities offered at Park Station and the location make Park Station the choice of many repeat guests. Most in town properties do not have the room for a courtyard with a pool and outdoor hot tub. Many of our guests return year after year due to the great experience they have staying with us. The 60 five star reviews on VRBO reflect that. Great location a stone's throw from Main Street and Town Lift, unit very comfortable. Very comfortable unit with roomy living room and dining area and nice kitchen. Location fantastic, less than 5 minute walk from Town Lift and Main Street with easy access to slopes, restaurants, ski rentals, etc. We really enjoyed our stay, perfect for 2 guests or 3-4 if use foldout. Only suggested improvements are more paper goods (we had to buy more paper towels and toilet paper) and more thorough cleaning of dishware and silverware by cleaning staff ahead of stay. Sorry to hear about the paper goods but it would be helpful to hear about that while you were staying in the unit and I would have had more dropped off. I was the person staying in the unit right before your stay and all the dinnerware was left clean. It is impossible to have every item in the kitchen taken out and checked by cleaning staff, especially when the kitchen is as well stocked as ours is. We have a 2 year old Bosch dishwasher that has multiple cycles that does an excellent job of cleaning the dishes. Stayed here with my wife and 18 y.o. daughter. Very clean and a well provisioned.kitchen. Unit is in very good shape. We usually rent ski in ski out, but Park City is a great ski town and we enjoyed being so conveniently located. Easy access to pool and condo with 4 numbers you punch in - no need for digging out card to swipe. Well designed hot tub adjacent to pool - subdivided into 3 sections each with independent control of the jets. Great place, fantastic location. Well equipped kitchen, all the amenities that you need. Property is in a great location to main street in Park City. It was very well maintained. The process to make the reservation and access the property was very easy. Communication with the property owner was great! Thank you. We are always updating our unit. Our kitchen renovation has been much appreciated by renters this year. Our new appliances include an electric induction cooktop which is far superior to the typical electric ranges found throughout most Park Station units. We look forward to your return. a short walk to Town lift where tickets can be purchased, triple chair up to mid mountain, ski back down on intermediate town runs or download at days end on Town Chairlift.